"What's on your mind today?" I asked Rob. "I am grappling with how to be the best CEO I can be for my company. I worry that I am not as effective as I want to be," he replied. In this second month of our trusted advisory work, Rob gave me an opening to address what mattered most for his future opportunity, by candidly disclosing his concerns. I inquired further to understand what triggered this thought process and what changes he was hoping to create. Here is what I then offered. "I believe you can lead your team to achieve remarkable success. To do that, you must refrain from eroding your potential for greatness." To elucidate my point, I proposed the following logic. "As a CEO, you have multiple responsibilities and 'jobs' within your job. The mandate of the CEO role is to unleash the fullest potential of the business. To achieve this outcome, you must help your people bring to life their greatest potential and release their brilliance. Before you can help your people discover those capabilities, however, you must unleash your own potential for greatness. If you are not operating at your highest level, you cannot expect the people around you to perform at theirs. Here is the insight: unleashing your fullest talent and leadership impact requires you to actively sidestep the traps that erode a leader's potential for greatness." Rob responded quickly to my provocative proposal by asking, "What do you mean erode my potential for greatness?" What is greatness? How can I develop my own greatness and that of others? 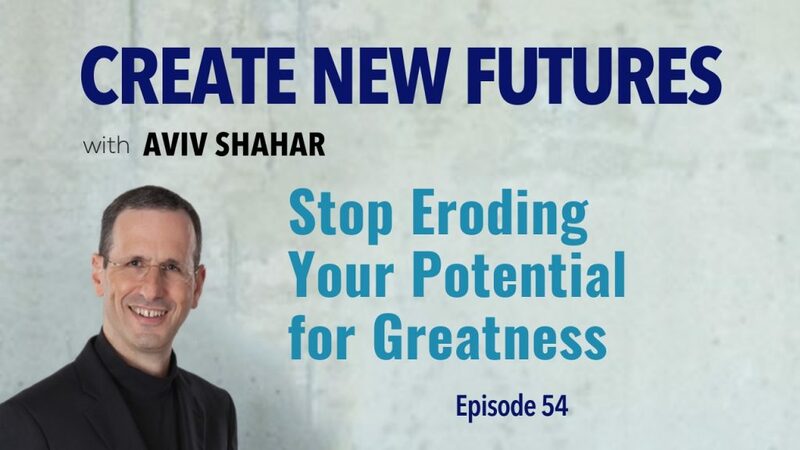 How do I erode my potential for greatness? What can I do to prevent this outcome? Because ours is a celebrity-obsessed culture that sells personality cult stories, the concept of greatness has been distorted by coupling it with celebrity, fame, wealth, and power. Greatness is not an automatic characteristic or trait of any person. Contrary to Hollywood's storytelling, no one is born into greatness. Furthermore, people cannot realize greatness on their own. The potential for greatness may be manifested when three conditions converge to create movement and outcomes that are so outstanding that they seem almost magical: the person(s), the platform, and the purpose. As described in my earlier key How to Reach Mastery, the person or group of people in question must be fashioned in the crucible of the desert journey, where their formation and alignment are developed by overcoming resistance. That is the first condition. The second condition is the platform that the person develops or walks into - the company, organization, band, production, ecosystem - must be purposefully aligned. A shared purpose is the third condition. The conditions for greatness are in place when the person and the platform are aligned with and inspired by a greater purpose. When these three factors develop resonance that produces flow, the conditions for greatness are in place. We've seen greatness reveal itself in sports teams, in screen productions and Broadway plays, and in organizational and professional teams. In these situations, a cohesive effort pulls everyone into a unity of purpose in ways that allow individuals to transcend their egos and together serve the team's mission. When the people and the platform are inspired and galvanized to become one with their shared purpose, a transformation occurs. Everyone involved becomes and feels bigger, because they feel part of something greater than themselves. The resulting transference of perseverance, power and presence enables them to move anyone they encounter. Greatness is apparent when the focusing presence of a purpose pulls everyone together to perform at a level higher than they could by themselves. Even when the leader, or the "star performer" in the front, is the most visible expression of the greatness at work, that manifestation is made possible by the collective efforts and contributions of everyone involved. That is why facilitating and preserving greatness are such a challenge. Greatness requires focus, consistency, sacrifice, devotion to purpose, readiness to transcend egos, a strong service orientation, care and attention to details, adaptability and resilience, stamina and forbearance, and the contributions of many people. In the context of leading a company, your entire value chain - the hiring process you develop, the culture you nurture, the communication you cultivate, the management system you establish, the focus you bring to the markets and the clients you serve - is the platform that empowers and enables people to operate as an orchestra working together to serve the organization's purpose. When the people, the organizational platform and the purpose they serve are aligned with each other in an optimal way, the conditions for greatness are in place. Here are three behaviors that erode the potential for greatness. As a leader who desires to facilitate the path to greatness for yourself and others, you must address each one proactively. You erode your potential for greatness by choosing to settle for suboptimal results. Accepting short-term pressures as an excuse to compromise quality, tolerate mediocrity, and rationalize expediency over values and principles opens mental and behavioral gates that tend to replicate quickly and expand like a virus. Research demonstrates that students and co-workers infect each other with good and with bad habits. Diluting quality standards and lowering expectations are insidious threats as they erode your potential for greatness. They begin when you accept lower performance from yourself and others. The antidote is to hold yourself and others accountable to the highest level of intent and continually upgrade expectations as you grow. The best teams do not lower expectations to hedge against failure. If they aimed to achieve 10 points of growth yet their hard work and committed performance resulted in 7 points, they debrief, learn, upgrade their approach and move on to climb the next mountain. Gaps and failures are treated as a learning opportunity, not as a threat. Second, you erode your potential for greatness when you consciously or inadvertently enable cross-purpose work that conflicts with the agreed upon mission and that follows a different agenda. Confusing strategy with tactics and then changing tactics expediently to address a near-term opportunity that brings no long-term value is one way that cross-purpose work may infiltrate the organization. This behavior begins when one department or team creates an isolated approach in what at first appears to be an adjacent strategy but quickly develops as a divergent effort toward a conflicting future. The best leaders and teams refuse to allow the organization's mission to remain a poster on the wall. They bring the mission to life by validating all activities and resource allocation choices inside the purpose and strategy framework. As the landscape changes and new data become available, they continually interlock and align the work, ensuring the coherence of intent and unity of purpose. Creative tensions and alternative points of view are not feared; rather, they are cherished as necessary inputs to the development crucible. Third, you erode your potential for greatness by allowing your ego to override the meritocracy of value contribution. Here is how a bright executive articulated to his team this low-on-ego, high-on-value mindset: "We must lead when we can shape outcomes, follow and support others when they are best positioned to lead, and when we cannot lead and are not in a position to help, we simply must get out of the way." Permitting personalities to take precedence over contribution and value represents a hazard to the organizational potential. Allowing your ego to lead often is followed quickly by cross-purpose work and the lowering of standards and expectations. The best teams celebrate the diversity of individuals with strong personalities while demonstrating that value contribution is the guiding principle of their joint work. Now it's your turn. Turn the key. Refuse to allow yourself to lower standards, participate in cross-purpose work, and engage in ego-over-value behaviors. Unlock your and your team's potential for greatness by celebrating the diversity of talent, working toward a unity of purpose, and facilitating organizational congruency and alignment.